Nestled beneath my ’66 Oldsmobile Delta 88’s dashboard hung a marvel of technology granting me access to broadcasts mere mortal AM radios couldn’t. It was a brave new static-free world called FM. My FM adapter is early evidence of what is obvious to all who know me: I am an early adopter. Live long enough and you’ll see history repeat itself–and so it is with my XM Radio. When I got another cool little adapter allowing my now merely mortal FM radio to receive broadcasts from space, I thought I was out front. And, like my FM adapter, I paid good money for that gadget. 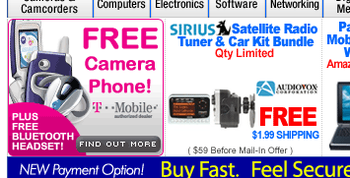 Last night, I received a broadcast email with amazing offers and about spit out my decafe latte… There, right next to the free picture phone (paid good money for mine) was FREE satellite radio. FREE! And in case you’re wondering why you can now buy a DVD player at the grocery store for $29 (like I did last week), you better read this. Pioneers get the arrows, settlers get the land. I’ve heard it many times, but it only recently dawned on me: pioneers must not be in it for the land. They’re in it for adventure: cutting a new trail, opening fresh territories, pushing at boundaries. So it goes with Podcasting. Since being created recently, the number of available podcasts has ballooned into the thousands; some are good, most are… unlistenable. And yet, the pioneers are driving where no bandwidth has gone before. Settlers have now begun arriving in this brave new world. Audible, the audio book people, have announced a tool which, beginning next month, can track how many people actually listen to podcasts. Until now a download count was the only available metric–and that’s plenty for pioneers. Settlers, on the other hand, need more finite accountability. another user. With the tools, “you can build a bona fide rate card” for advertising, says Foy Sperring, Audible’s senior vice president for strategic alliances. Rate cards? We don’t need no steenkin’ rate cards, the pioneers shout back over the rumble of thundering hooves carrying them hooting with laughter into the next valley of innovation, leaving us behind in their dust to settle the land of podcasting. No rules. No formulae. No best practices. It’s a new world and no one has a clue. He makes an important: we’ve moved from permission marketing to attraction marketing. ASKING consumers to please give us their time (permission marketing) is a quaint notion rooted in an era when we HAD time to give. In the compressed age we’re living in, ATTRACTING consumer attention means giving them a more appealing idea capable of preempting the one they have now. Here’s a hint: the idea they’ll find more appealing is not about you. Like sales, advertising is a conversation between two people. Effective advertising doesn’t speak to anyone, it speaks to every ONE it reaches. When you stop advertising and start conversing about what matters to customers, you will have begun serving a tasty meal that sticks to consumers’ minds.